Probiotics: What Are They and Are They Actually Good for You? Health magazines and fitness gurus are all talking about probiotics. This kind of bacteria is not a new trend. Before you go all-in on probiotics, you should know how it can affect your body, especially if you have a chronic health condition. Learn more about what probiotics are and whether or not they’re actually good for you. When you hear about bacteria, you probably think about germs, infections and getting sick. However, bacteria can be good. Probiotics are good bacteria that help keep you healthy. According to the American College of Gastroenterology, there are over 400 different species of bacteria living in your digestive tract. It’s normal to have some good bacteria and some bad bacteria in your digestive system. Typically, the good bacteria balance out the bad and your body functions normally. However, when that balance is interrupted, you could get sick. Probiotics help make sure you have enough good bacteria in your belly to keep you healthy. The foods you eat, your stress levels, sickness and other causes can influence the good and bad bacteria in your digestive system. Probiotics can help your body run smoothly, especially your digestive system. 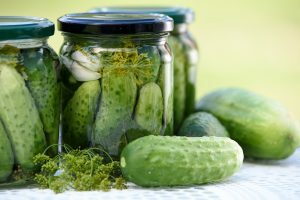 Common examples of probiotics include yogurt, sauerkraut, pickles and kombucha. Some cheeses, such as cheddar, gouda and parmesan, can also be a source of probiotics. While many people get probiotics from their diet, you can also take probiotic supplements. There are different types of probiotics. Each type of good bacteria affects your body differently. You may notice feeling a little extra gassy, but most healthy people don’t experience any side effects after consuming probiotics. Ask your doctor or a registered dietitian about adding probiotics to your diet. Are Probiotics Actually Good for Me? Research suggests some probiotics can help prevent diarrhea and improve digestive function. Your gut has a unique blend of bacteria. This means that everyone may respond a little differently to probiotics, whether the good bacteria comes from food or a supplement. You should always discuss specific questions about your digestive health with your doctor. Amber Pharmacy patients can talk to me, licensed-registered dietitian Megan Hall, for any questions about probiotics and nutrition. National Institutes of Health reminds us that the Food and Drug Administration (FDA) has not approved any probiotics for preventing and treating health conditions. Probiotics may be beneficial for your skin, as well as your gut. New probiotic skin treatments are either applied topically or taken orally. Dermatologists and skin care experts are studying the effects of probiotics used in acne and rosacea treatment. Good bacteria may also help protect your skin from aging. Talk to your dermatologist if you have questions about probiotic use in skin care. Will Probiotics Affect My Medication? Antibiotics are medications that kill infectious bacteria when you’re sick. These medications kill both the good and the bad bacteria in your body. In some cases, probiotics can be great for people while they’re taking antibiotics. Adding more probiotics into your diet can help you replace the good bacteria your body needs. However, a diet rich in probiotics may not be ideal for people with health conditions or those taking certain medications. If you get frequent infections or have a week immune system, you should avoid probiotic supplements. The Mayo Clinic recommends caution if you are taking any medication that affects your immune system or if you have pancreatitis. Be sure to talk to your pharmacist at Amber Pharmacy before adding probiotics to your diet or taking a probiotic supplement. It’s important to learn how probiotics can affect your medications and your body, especially if you have a chronic health condition. Amber Pharmacy takes a whole-health approach to managing chronic conditions. As a member of the Amber Pharmacy healthcare team and a licensed-registered dietitian, I have the opportunity to counsel patients every day on their unique nutrition and dietary needs. If you have questions about your diet, including how add more probiotics, contact Amber Pharmacy to schedule a free consultation.